It's Saturday and we are resting. 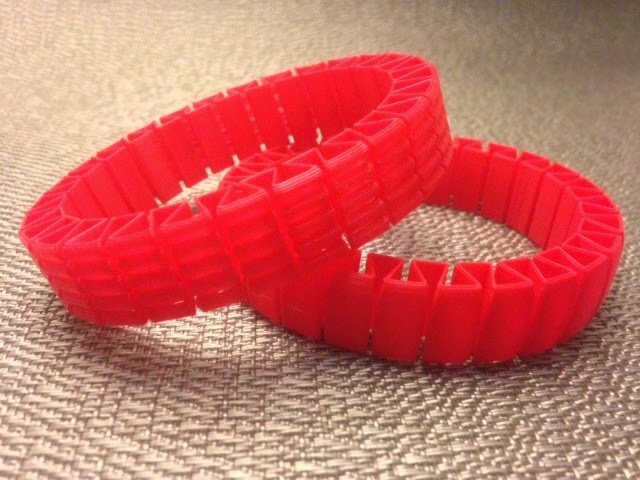 Kids keep asking me for stretchy bracelets so today I made some from owens' Smooth and ridged stretchlets model on Thingiverse. They came out great! I love the ridgy one and in fact wore one of them around all day today until it finally broke because am a fidget queen who kept flipping it inside-out and pulling it off and on again. Also I'm a liar because I actually printed these and wore them around on Wednesday 5/28 but I'm pretending that I did it four days earlier for this blog post. Settings: Printed on a Replicator 2 with .3mm/low resolution and a custom profile to get no roof, no floor, 0% fill, and only one shell around the outside. I used a raft but I'm pretty sure that it wasn't really necessary.